In photography, every decision, creative and technical, rides on achieving a good exposure. When shooting portraits or products, landscapes or architecture, we must control our camera's settings to ensure that just the right amount of light is allowed into the camera. When we strike the right balance in our exposure, we have a full range of tones, from pure white to deep blacks. We have rich visual detail. We have a sense of dimension. The colors and tones and contrast in our images weave the visual story of our subject and scene in a way that visually computes. As a result, we see just the image we strove to create, rendered perfectly in a way that satisfies our creative vision. 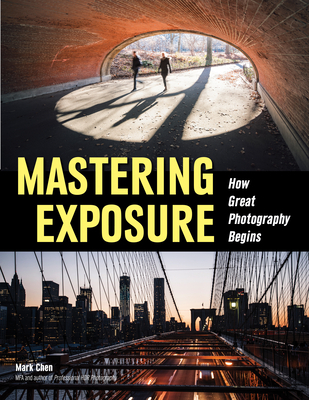 In this book, Mark Chen shows you how to take full control over the science of exposure, providing you with the foundational skill-set you need to maximize your artistic vision. Mark Chen is a Photographer, Adobe Certified Photoshop Expert/Instructor, Photoshop Trainer and the owner of Mark Chen Photography based in Houston, Texas. Chen's passion for photography started early, as a teenager in his native Taiwan. A pursuer of photographic artistry and a believer in imaging technology, Chen embraced digital photography with great enthusiasm. His computer science degree helped him feel at home with the digital post productions. Pairing the creativity, techniques and think-outside-the-box attitude, Mark Chen has established himself as the most creative wedding photographer whose wedding album designs are sought after by clienteles with discerning tastes. In addition to his studio operations, Chen teaches Photoshop at Houston Baptist University. and Houston Community College. He is touring the nation giving Photoshop training conferences to people of all professions including professional photographers. This teaching experience is a factor in making his book easy to follow. Look for Mark Chen's future books about Photoshop, digital photography as well as his artistic endeavors that would push the limit of what pixels can show us, at MarkChenPhotography.com.